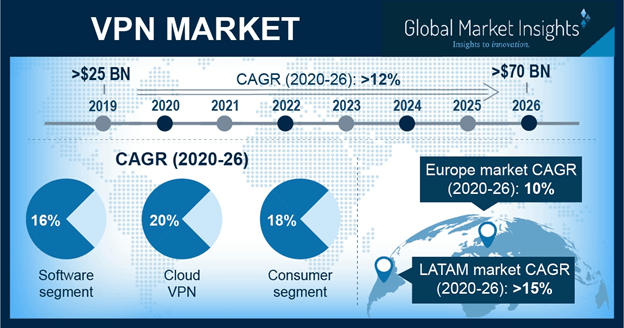 Virtual Private Network (VPN) Market size is set to exceed USD 54 billion by 2024; according to a new research report by Global Market Insights, Inc. The virtual private network market is propelled by the rising number of advanced and complex cybersecurity threats. Over the last decade, the internet has become a universal platform for conducting business. The cybercriminals are leveraging on the internet to commit thefts and frauds. The mobile devices are also not immune to this trend. The organizations and consumers are looking for products and services to safeguard their transactions conducted through the internet. The VPN provides a safe and cost-effective solution to protect the company networks. The explosion of mobile and wireless devices within organizations is driving the virtual private network market. Falling prices and improving internet speeds are driving the adoption of mobile devices across businesses and consumers. The organizations are leveraging on the use of mobile devices, such as smartphones, tablets, and laptops, to access various business applications from remote locations. Security has become a primary focus for the organizations as increasing number of transactions are carried out through mobile devices. Hence, the VPN technology has become a crucial component across various business verticals. The IP segment held 25% share in 2017. The virtual private network market is primarily driven by its cost-effective nature. It provides WAN engineers with total control over the company network and allows them to perform any on-the-fly configuration changes to rectify any problems that might arise. The limited quality of services over public internet connections is restricting its adoption across large corporations. The cloud VPN market is estimated to grow at a CAGR of over 21% during the forecast timeline. The increasing shift toward virtual applications and the surge in demand for cloud services are nurturing the growth of the cloud market. In addition, the rising data concerns are also further adding to the growth of the cloud market. The remote access market is expected to grow at a CAGR of over 17% over the forecast time frame. The growth of the market can be attributed to increasing need for an affordable way of sending secure data to offsite employees. Therefore, remote access topology has been widely implemented across SMEs. The extranet market is anticipated to grow at a CAGR of 14% over the projected timeline. The increasing demand for secure remote access solutions to communicate with external stakeholders, such as customers and business partners, is fostering the growth of the virtual private network market. The commercial application sector is predicted to grow at a CAGR of 15% over the forecast time period. The commercial segment comprises healthcare, BFSI, IT & Telecom, manufacturing, and government. The increasing adoption of cloud technology and digital recordkeeping in the healthcare industry is changing the way people access data. Thus, the healthcare establishments are embracing VPN technology to protect patient’s sensitive information from unauthorized access. The consumer market is expected to register a CAGR of approximately 20% over the projected timeline. The increasing internet penetration and widespread adoption of internet-enabled devices are driving the growth of the virtual private network market. The European virtual private network market is anticipated to grow at a CAGR of over 13% in 2017. This growth in the region can be attributed to favorable government initiatives and compliance regulations mandating companies to adopt advanced security measures. The Asia Pacific region is predicted to grow at a CAGR of 20% over the forecast timespan. The widespread digitalization across various industry verticals and the growing number of smartphone owners are driving the growth of the market in the region. The presence of protectionist policies in the region is limiting the growth of the VPN market. For instance, in March 2018, the Chinese government restricted the use of VPN services by foreign providers. Furthermore, it has also instructed the foreign companies to establish a dedicated line for cross-border communication. This is expected to increase the cost of the company’s communication infrastructure. The companies operating in the virtual private network market are Airvpn Di Paolo Brini, Anchorfree Gmbh, Anthasoft, S.A. De C.V., Array Networks, Inc., Avast Software s.r.o, Blackberry Limited., Bufferd, Inc., Checkpoint Software Technologies, Cisco Systems, Inc., Citrix Systems, Inc., Columbitech Ab, Cryptzone, Cyber Ghost, Express VPN, LLC, Golden Frog, GmbH, Google, Inc., IBM Corporation, Juniper Networks, Inc., Microsoft Corporation, Mudhook Marketing, Inc., NCP Engineering GmbH, NetMotion Software, Inc., OPENVPN, Inc., Opera Software, Safer Social Ltd., Smith Micro Software, Inc., TunnelBear, Inc., WatchGuard Technologies, Inc., and Windscribe Limited. The players working in the market are forming alliances with various VPN providers to strengthen their product portfolio and increase their customer base. For instance, in March 2017, NCP Engineering announced its partnership with Juniper Networks to enable a VPN remote access solution for SRX series firewalls.